I have been working in the cancer field for over 25 years, and I frequently hear the word ‘carcinoma’ used interchangeably with ‘cancer’. Not just by lay-people, but also by professionals working in the cancer field. I am passionate about cancer and, in particular, cancer education. I feel that we will not ‘cure’ our way out of this cancer epidemic, but we may be able to ‘learn’ our way out. 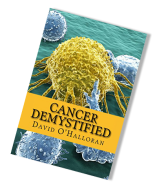 Cancer education is a vital part in the war against cancer, and as such we should use cancer terminology correctly. We should be as unambiguous as possible with the words we use to describe this disease. Carcinoma is derived from the Greek 'karkinoma' meaning sore or ulcer. It is a term which is used to represent cancer developing in ‘epithelial tissue’, and only epithelial tissue. Note, we call tumour deriving from connective tissue (bone, cartilage etc) – ‘Sarcoma’. Epithelial tissue is usually found lining the inner surface of our organs. We call this the ‘mucosa’. (Note: our skin is also made up of epithelial tissue!). Here you can clearly see it is the mucosa that is made up of epithelial tissue. The organ itself, is made up of the mucosa surrounded by layers of connective tissues. Imagine you drink your alcohol, eat your ‘bad’ food, smoke your cigarette…which layer of tissue is going to get damaged?…yes the mucosa…which is made up of epithelial tissue! No surprises then, that the vast majority of cancers are of epithelial tissue. Therefore, we come across that term ‘carcinoma’ more often…and therefore, we think of it as a general term for cancer! However, it isn’t. It is very specific and refers to a cancer developing in epithelial tissue and only epithelial tissue! So please think on when using this terminology. Make sure you use it to describe exactly what you want to describe and eliminate any possible confusion.